For many people, asking for money can be uncomfortable. This common feeling often translates over to the nonprofit development world. Many development staffers approach their solicitations as if they were asking donors for a favor. However, this mentality and approach rarely evokes confidence and enthusiasm from donors. Rather than simply asking for a hand, you need to show prospects that you are offering them a unique opportunity. A switch of language, tone, and content can instantly shift a donor’s perspective of your fundraising ask. You can go from communicating “I’m sorry to bother you, but can you help us out?” to “This is an opportunity you don’t want to pass up.” After all, your organization is making an impact in the world, and you’re inviting them to take a part in it. It’s just a matter of showing donors they want to be a part of your mission. Create this connection by tapping into some fundraising psychology. In this case, turn your mission into something that supporters believe is a personal extension of themselves. According to Jen Shang, a philanthropic psychologist, the decision to donate reflects a psychological switch that happens when a donor connects your cause with their innermost sense of who they are. In other words, supporters are more likely to give when they internalize your cause. When your cause becomes personally meaningful to donors, your fundraising ask becomes an opportunity to act as the people they believe themselves to be. It’s up to you to help them make that connection. You can create this sense of identity and belonging for your supporters by switching up your word choice and content. Here are three ways you can turn your fundraising ask from a request, to an opportunity to become the person a donor wants to be. Start by looking at your word choice. Tailor your language so supporters can connect the dots between supporting your cause and their core sense of self. Try sprinkling a few of these words into your fundraising appeal. Remind donors of their charitable inclinations. Your tone can also make a big difference in how donors perceive your fundraising ask. Many fundraisers can feel as though they are stepping on people’s toes when soliciting donations. But confidence can make your ask much more attractive to donors. Frame your appeal as a special invitation to make a difference. Your language and tone should demonstrate that you are giving donors the opportunity to do the good they want to see in the world. Rather than asking “Would you consider giving $25 to the Grossmont Cancer Society?”, confidently say, “As a world-changer, you can give a child the treatment she needs today.” This is a donor’s chance to be the catalyst for change. 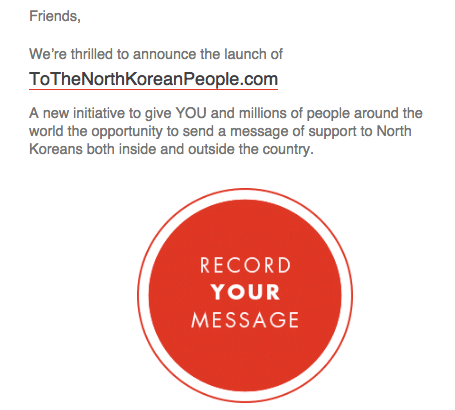 Check out how Liberty in North Korea drums up enthusiasm for their new initiative in this email. Explicitly using the word “opportunity” evokes excitement for this worthy cause. While your fundraising ask should appeal to donors’ innermost perceptions of themselves, let them know you’re also inviting them into a larger community surrounding your organization. People are often more eager to get involved when they see others have already validated your cause. By displaying your fundraising community, you can provide social proof of your mission and create a sense of belonging for your prospective donor. Bring potential donors off the sidelines by building a sense of community around your story and cause. Top fundraiser leaderboards on your website and campaign pages are a great way to do this. Share and retweet supporter’s posts on social media to make their involvement more tangible to the rest of your community. 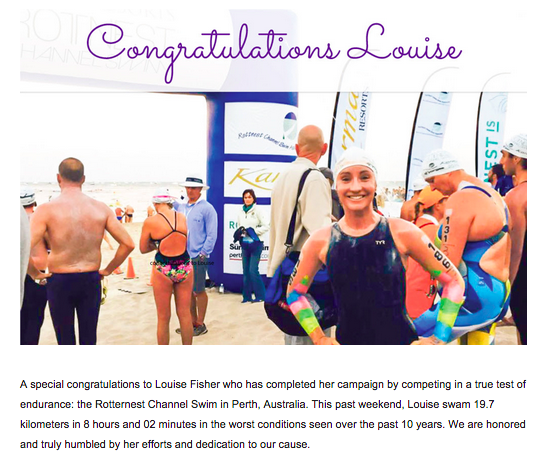 You can also spotlight individual fundraisers in your email appeals, like Love Your Brain does here. Let donors know that your fundraising ask is the opportunity they’ve been waiting for. By crafting compelling messages that resonate with your audience, you can help donors find the personal meaning in your cause. Show them that by coming onboard, they can stand alongside others who choose to make a difference.